What is Eliminall and who is it for? For the treatment of flea (Ctenocephalides spp.) and tick (Dermacentor reticulatus) infestations. Fleas will be killed within 24 hours. For the treatment of Trichodectes canis biting lice infestations on dogs. Most lice are killed within 2 days. Insecticidal efficacy against new infestations with adult fleas persists for up to 8 weeks. Eliminall has a persistent acaricidal efficacy for up to 3 weeks against Ixodes ricinus and up to 4 weeks against Rhipicephalus sanguineus and Dermacentor reticulatus. Ticks will usually be killed within 48 hours. However, if ticks of some species (Ixodes ricinus, Rhipicephalus sanguineus) are present when Eliminall is applied, all the ticks may not be killed within the first 48 hours. Eliminall can be used as part of a treatment strategy for the control of Flea Allergy Dermatitis (FAD) where this has been previously diagnosed by a veterinary surgeon. 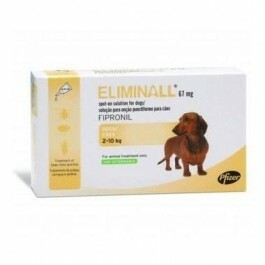 For treatment and prevention of flea and tick infestations. How do I use Eliminall? Remove the pipette from the triplex bag. Hold the pipette in an upright position, twist and pull the cap off. Turn the cap around and place the other end of the cap back on the pipette. Push and twist the cap to break the seal, then remove the cap from the pipette. Spread the hairs of the animal between the shoulder blades to make the skin visible. Place the tip of the pipette on the skin and squeeze gently to empty its contents onto the skin, preferably at two spots, one at the base of the skull and a second 2-3 cms further back.It is important to make sure that Eliminall is applied to an area where the animal cannot lick it off, and to make sure that animals do not lick each other following treatment. The hair should be parted and Eliminall applied to the skin. Temporary changes to the coat (clumped/greasy hair and/or deposits on the hair) may be noted at the application site which normally disappears within 24 hours. Is there any further advice I should know about Eliminall?